On 27 October, states at the UN General Assembly voted in favour of a landmark resolution mandating negotiations on a new treaty banning nuclear weapons in 2017 (see commentary on the resolution and the vote here). The majority of the world’s states support this initiative, which represents an historic opportunity to definitively prohibit nuclear weapons – placing them on the same legal footing as other weapons of mass destruction – and break the deadlock in progress towards the elimination of these inhumane and fundamentally unacceptable technologies. Nuclear-armed states including the UK – and a number of their allies who claim dependence on others nuclear weapons in their military strategies – have on the other hand opposed the reframing of nuclear weapons as a humanitarian issue, and moves towards a ban with or without their participation. The UK spoke against the prohibition of nuclear weapons with a new treaty earlier this month at the UNGA, calling on countries to “do no harm” to the international legal regime with such an instrument (though there are no clear arguments as to why a prohibition treaty would not simply support and enhance international frameworks). In the context of the devastating harm done to people, communities and the environment by nuclear weapons, such a comment is remarkably insensitive both to the victims of these weapons and the concerns of the majority of states to prevent harm and ensure the security of all people by banning nuclear weapons (security concerns that the UK has also dismissed). An open letter (reproduced below) coordinated by the International Campaign to Abolish Nuclear Weapons, UK, and signed by organisations including Greenpeace, Scientists for Global Responsibility, Campaign for Nuclear Disarmament (CND), and the global health charity Medact, as well as Article 36, was sent to the UK Foreign Secretary before the vote, urging the UK to be part of the ban treaty process as a supposed proponent of multilateral disarmament. As the resolution went to a vote, the European Parliament called on EU Member States to support and participate in prohibition negotiations, with votes in favour of its resolution from British MEPs from the Labour, Liberal Democrat and other parties. Pressure on the UK’s position as a nuclear armed state will be building in the coming year with the start of negotiations, both in international forums and domestically – with the ban treaty becoming a reality, it will be increasingly difficult for the UK government to dismiss or ignore. We, the undersigned organisations, are writing to urge the United Kingdom to vote in favour of an historic UN Resolution on “Taking forward multilateral disarmament negotiations” that is being tabled at the United Nations General Assembly this month to mandate the start of negotiations in 2017 on a treaty to prohibit nuclear weapons. The resolution has been put forward by Austria, Brazil, Ireland, Mexico, New Zealand, Nigeria, South Africa, and is supported by a large majority of states that participated in the UN Open-Ended Working Group on nuclear disarmament in 2016. Under Article VI of the Nuclear Non-proliferation Treaty, the UK is legally obliged “to pursue negotiations in good faith on effective measures relating to the cessation of the nuclear arms race at an early date and to nuclear disarmament”. The Secretary of State for Defence Michael Fallon MP has said, “We share the vision of a world that is without nuclear weapons, achieved through multilateral disarmament”. We were therefore alarmed and disappointed to hear that on Friday 14 October at the UN General Assembly the UK disarmament ambassador delivered a statement reiterating that the UK position remains to oppose negotiations on a nuclear weapons ban treaty, placing our country within the minority of states that reject the historic opportunity presented by this initiative. Ambassador Rowland said in a statement that rather than negotiating a prohibition treaty, nations should abide by the principle of “do no harm”. But the UK and other nuclear armed states continue to threaten catastrophic worldwide harm to people and the environment through their continued deployment of nuclear weapons which creates an existential risk of accidental, unintended or deliberate use. Far from being a leader on multilateral disarmament, the UK government is choosing to retain its nuclear arsenal and upgrade associated systems, as well as currently refusing to support new multilateral negotiations towards a global ban treaty. The UK is rapidly losing its claim to credibility on nonproliferation and disarmament: the government must re- evaluate whether it will support the UN ban process or end up on the wrong side of history. The existence of nuclear weapons poses a dangerous threat to global security. Any intended or unintended detonation will have catastrophic humanitarian and environmental consequences. The international community has already outlawed other inherently inhumane and indiscriminate weapons, from chemical and biological weapons to anti- personnel landmines and cluster munitions. 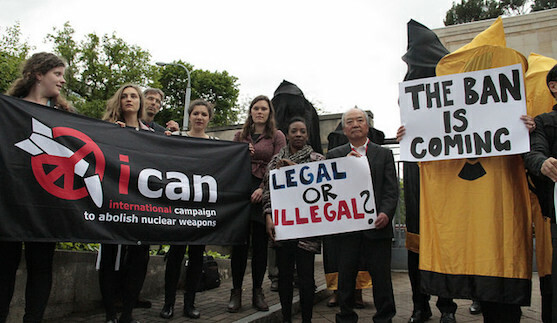 A ban on nuclear weapons is long overdue – and the UK must be part of that process. We expect and urge the Government to reverse its position before voting begins on 27 October 2016.